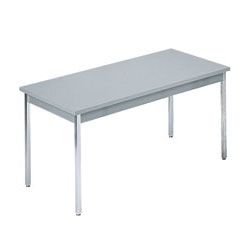 Add this great looking to table to your office. 1 ¼” Particleboard Top with High Pressure Laminate with 3mm Edging and Backer Sheet. 1 ¼” 18 Gauge Square Steel Legs. Barricks Regency Fixed table features a 1-1/4" thick laminate top with radius corners, 3mm edge banding, 2-1/4" high metal apron. A high pressure laminate top helps prevents scratches. Legs have adjustable leveling glides.